Right now, marketing is in flux. For example, the emergence of big data and the steady beat of technology change are rewiring the landscape and rewriting the rules of engagement. The intersection of career relevance, trend awareness and adapting to these changes launched the following ideas for marketing career management led to the creation of the Agile Careerist Project. What started out as a quest to fine-tune my evolving marketing career sparked the launch of a research project, focused on agility. When two years of research extended beyond the persistent musings of my curious brain, I was convinced agile and career belonged together. Just like heart and soul or time and tide. After interviewing numerous multigenerational workers, I was certain the future of work depended on a new perspective. The new view flexes with the accelerated pace of technology and swiftly evolving trends. Inspired by agile software development methods, I created a model for helping others flourish in the workplace, along with a list of agile career principles. Pursue side gigs, education, or hobbies to pave the way for creative thought, extra income and future job opportunities. Take a cue from software engineers. Develop an idea backlog for future use like they do for software releases. Save the pixie dust of your creative genius for a rainy day when you are out of ideas, yet still need to make progress. No one can do it alone. Seek the advice of people you most respect: mentors, trusted friends, and savvy colleagues. You can also be part of a feedback squad for someone else. You are the most valuable asset of your career journey. Uncover your distinguishing characteristics or brand values. Package your portfolio of skills and be consistent in how you communicate and present yourself to the human workplace. Ask yourself the question, “Am I in alignment with my brand values?” Spread the story-driven message in real life and across your digital networks. Be bold and dare to be different from your competition. 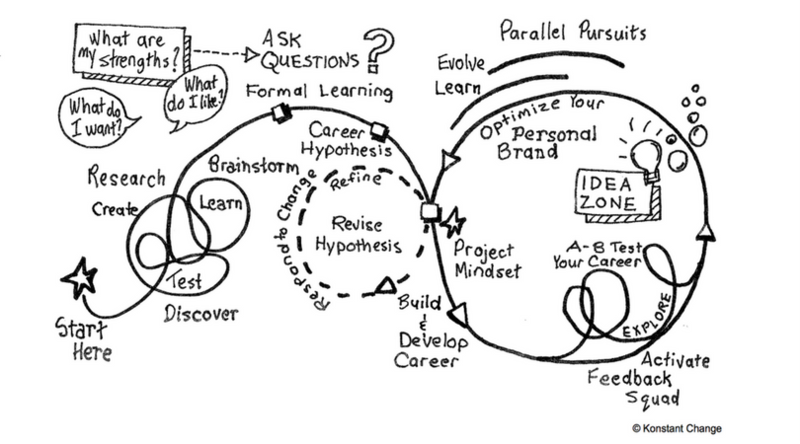 Progress through your career with two to four year projects, building upon your incremental knowledge. Harness the enthusiasm of a fresh start, master the job and build new competencies. Become the most eligible employee for promotion or the best candidate at another company. Test your interest and aptitude as you say “Which do I like better, job A or B?” Give yourself permission to explore as you discover the best fit for you and your talents. Acceleration of technology and continuous state of change calls for flexibility and willingness to adapt. Lean into change and make adjustments to your career status, rather than stick to a rigid plan. Acclimate to economic developments and corporate adjustments by uncovering engaging projects. Discover market and employment gaps you can fulfill in a unique manner. As a perpetual researcher, ruled by the curiosity gene, I am interested in your thoughts. Have you applied any of these principles in your career?